Kick off your holiday shopping at your own pace with the annual Black Friday and Small Business Saturday sale at Prince's favorite hometown Wrecka Stow! 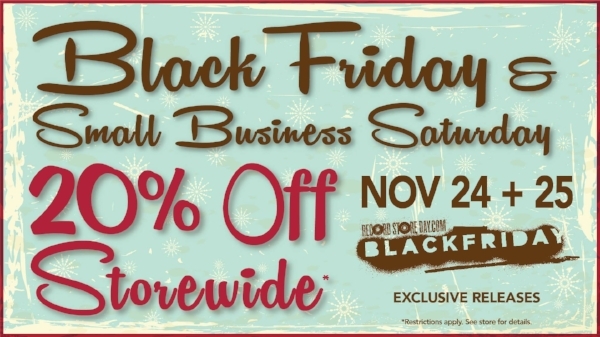 Take 20% off storewide* from Friday, November 24th through Saturday, November 25th. *Sale excludes gift cards, tickets, tobacco products, Mix & Burn CDs and yellow-tagged music already on sale, including exclusive Black Friday Record Store Day releases. Exclusive Black Friday Record Store Day releases! Here's a look at what's being released. They won't know what they will have until just before Thanksgiving. Erik Koskinen will play a free set at 2:00 p.m. to celebrate the release of his forthcoming EP "Cruising Paradise." Get one of Electric Fetus' awesome January coupon books with every purchase starting on Nov. 24th.